Discussion in 'Anything goes' started by Johnny Dangerously, Jun 8, 2011. The one with most of your favorite songs. The one you feel most at home returning to in your mind when you hear the songs. The one you'd choose if you could listen to songs only from one particular year for the rest of your life. What year would it be? Tough one. I'd really have to look at the different years. 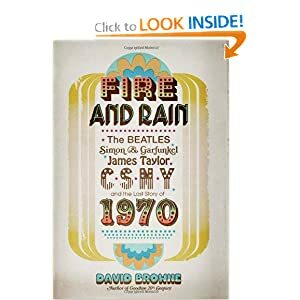 I saw the author of this book on Morning Joe the other morning and he made the case for 1970. For me, it's no contest: 1966. So many great songs from that year, especially in the rock and soul genres. 1971 would be second, but by several lengths. If you're going to list a year, at least list a couple of your favorite songs from that year or a couple of the best albums that were released. Rush put out Grace Under Pressure. Powerslave was a very good Iron Maiden album. Born in the U.S.A. came out, Purple Rain and Like a Virgin too. This might also mean I have to hear the Ghostbusters theme, but that's OK.
For me, it was probably 1984. That's when I really started paying attention to music. Born in the USA -- not Bruce's best album but it was my introduction to him (That album and the occasional airing of the Rosalita concert video). Two Tribes by Frankie Goes to Hollywood -- Much better than Relax, which was good in its own right. I could go on and on and on about 1984 music, especially soundtracks. EDIT -- dammit, Rasputin beat me to it. No Elvis, Beatles or the Rolling Stones. there are some great songs on that list. most of them aren't classics, but they were what was on the radio junior/senior year of high school for me, so they are "take you back" songs.